Welcome back to another chapter in our eToro Beginner’s guide series. This instalment will talk about EOS, which is yet another challenger to Ethereum for the smart contracts throne. EOS was founded with the purpose of being the most powerful infrastructure for dApps. In mid-2018, it finally completed its year-long ICO, which raised an amazing USD 4.2 billion (the largest in 2018) and released its main net. However, since then it has been mired in some controversy, and has its fair share of sceptics. Before we address this controversy, let’s look at EOS’s structure and its performance claims, starting with its consensus mechanism. One of EOS’ main selling points is its DPOS consensus mechanism. In its mechanism, blocks are added to the blockchain through a group of 21 block producers. These block producers are, in turn, elected by EOS token holders with voting power being proportional to the amount of tokens held. Token holders thus delegate power to block producers in accordance with the amount of stake held, hence the DPOS title. You can see the current list of the top block producers on EOS here. Due to how this consensus mechanism works, EOS has claimed EOS has a potential transaction speed of 10k to 100k transactions/second. For reference, this would be about 500 to 5,000 times Ethereum’s current speed. If true, this would rival that of Visa and allow true commercial-level scalability in blockchain, one of its main challenges. On top of it all, EOS also has a legally binding constitution, serving as the ultimate reference document for all behaviour on the network, including the criteria for block producer selection. You can read the EOS constitution here. When talking about cryptocurrency tokens, there are always two parts—their function and their market performance. Unlike the Ethereum model where you must pay gas fees (quoted in ETH) to use the network, in EOS all token holders have access to the power of the network (storage, bandwidth, processing power), again in proportion to their token stake. Thus, EOS' only utility function is to serve as a proxy to how much access you have to the EOS network. The EOS token cannot be mined. In addition to the tokens sold during the ICO, new EOS tokens are created with every new block produced. Thus, it has an inflationary monetary policy. The inflationary rate is currently set at 5% per year. 80% of this inflation amount (4%) will be allocated to something called the Worker’s Proposal Fund, with the remaining going toward block producers. The Worker’s Proposal Fund is designed to fund improvements in the EOS network, thus theoretically making EOS purely self-funded. EOS’s USD4.2 billion ICO was a massive success, with the total EOS market capitalization reaching a high of USD16.9 billion at the end of April 2018. However, since then its market cap has fallen to about USD2.6 billion, which is an 85% decline. For reference, Bitcoin and Ethereum have declined by about 78% and 90%, respectively, from their 2018 highs, so EOS’s performance is nothing surprising. Nevertheless, EOS is and comfortably remains a Top-5 cryptocurrency. How is EOS Doing Since its Main Net launch? Despite the controversies elaborated below, adoption on EOS has grown quite a bit. According to dApp.com and as explained in CoinGecko’s 2018 Annual Report, it is now second only to Ethereum in terms of dApp adoption. Out of 1,423 dApps by end-2018, 235 were built on EOS and 1,045 on Ethereum. Still a long way to go, but not too bad given Ethereum’s significant first-mover advantage. 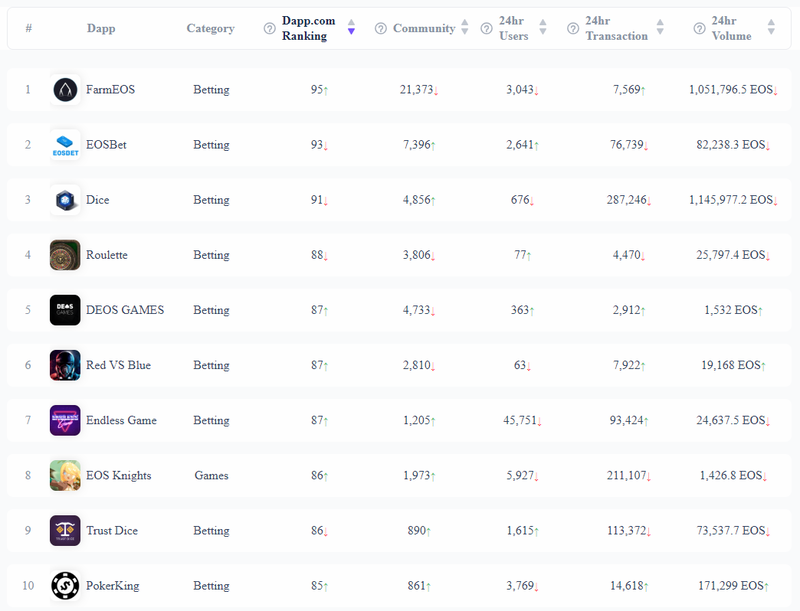 Here are the current most popular dApps on EOS, as compiled by dApp.com. Probably the most common criticism against EOS is that it’s centralized. With only 21 block producers, it is easy to see how a cartel can form. And while these block producers do have to be elected, those with enough EOS tokens could conceivably collude to select their preferred block producers. Further, block producers could themselves offer ‘incentives’ to token holders to get elected. EOS’s constitution, its ultimate arbiter, specifically prohibits incentivization by block producers to token holders and also states that no one single entity can control more than 10% of the entire circulating supply. However, people have asked whether this could realistically be tracked. Further, the constitution itself was written by Block.one, the company behind EOS. The 10% ownership limit is also exactly the amount of EOS in circulation allocated to Block.one during the ICO, leading to speculation the 10% cap was put in place so that no other entity got more control than Block.one. References in the constitution to arbitrations and penalties also seem to put Block.one in a central authority role. Finally, there are conflicting accounts about what is EOS’s ‘true’ transaction speed. While EOS has claimed that the EOS mainnet has already shown transaction speeds of over 3,000 transactions per second, some critics, using different computation methods have claimed EOS’s speed is actually on par with Ethereum. EOS is a promising project, and if based solely on market cap, looks to be the top contender to Ethereum’s smart contracts throne. But as of this writing, it still has a ways to go in proving itself.